The headless Food Faerie–a small, winged mannequin dressed in bright batik fabric carrying a satchel of artificial mangoes and poised to take flight–greets visitors to the exhibition Dress Up, Speak Up: Costume and Confrontation at 21c Museum Hotel in Lexington, Kentucky. The inaugural exhibition coincided with the opening of the museum-hotel on February 29, 2016, and will remain on view until the end of September. Museum Director and Chief Curator Alice Gray Stites brings together fifty-six works and a cadre of twenty-four socially engaged artists across two floors in order to elaborate an ambitious and audacious narrative about sartorial expression; means of perpetuating and challenging embedded codes of behavior; métissage (cultural mixing); constructing identity; and methods of combating dominant historical narratives and forms of cultural erasure. The artists in this group exhibition, representing fifteen nations, wrestle with these challenging and polemical concepts in media from traditional oil painting to photography to video to sculpture to tapestry. What’s most provocative about Dress Up, Speak Up is that many of the core motifs that unite the objects on display–forms of protest through attire, identity performance, questioning meta-narratives, remembering the oppression and exploitation of minorities–gain increased potency and relevance due to the exhibition’s site-specificity. 21c Museum Hotel now occupies the former fifteen-story First National Bank and Trust Company building, built in 1913, which is less than one hundred feet from the block known as Cheapside Park. The storied block has been the topic of much debate over the past year because it continues to house two commemorative statues of Confederate generals, and most significantly was a slave auction block where thousands of African-Americans were sold during the nineteenth century. This site-specific tension calls upon visitors to the city and its own residents to come to terms with how art, architecture, and public spaces have an impact on past and present, and sets the bar for future exhibition programming to be equally provocative and relevant. Yinka Shonibare’s sculpture Food Faerie recalls both the features of Renaissance putti (chubby angels) and the Greek goddess Nike, which in turn brings to mind how The Winged Victory of Samothrace shepherds guests at the Musée du Louvre from one gallery to the next. Atop the Daru staircase, Nike marks one of the critical junctures in the Louvre as visitors transition from the Sully wing to the Denon, from the art of Antiquity to works of the Italian Renaissance and nineteenth-century French painting. This design layout links the artistic developments of Greece and Rome to the Italian Renaissance and subsequently nineteenth-century French painting and sculpture, thereby falsely presenting the history of art as a teleological arc where Italy and France are the heirs to Western civilization. I raise this comparison because throughout the exhibition Shonibare–a multi-media British-Nigerian artist–offers critiques of how historical narratives are constructed and how vestigial values from the Enlightenment (the age when the Louvre, the first modern art museum, was founded) still circulate in the twenty-first century. As such, the artist, who has six works in the show, is rightly placed at the beginning because it sets the revisionist tone of the exhibition, and introduces guests to some of the major currents running throughout the galleries. Yinka Shonibare, M.B.E. (British-Nigerian), The Sleep of Reason Produces Monsters (America), 2008. Chromogenic print mounted on aluminum. Yinka Shonibare, M.B.E. (British-Nigerian), The Sleep of Reason Produces Monsters (Europe), 2008. Chromogenic print mounted on aluminum. The first section of the show encompasses the lobby of the hotel and includes a painting by Titus Kaphar, an elaborate and imposing costume by Nick Cave used for a performance piece, photographic stills from a performance piece by Berni Searle, and two large chromogenic prints mounted on aluminum by Shonibare (Figure 1). These prints from 2008, The Sleep of Reason Produces Monsters (America) and The Sleep of Reason Produces Monsters (Europe) are nearly identical and both reference a print series by Francisco de Goya titled “Los Caprichos” from 1797-1799. In the series, Goya critiqued the Spanish monarchy’s resistance to Enlightenment values and ideas. Shonibare appropriates the compositional design and subject matter of Goya in order to offer a postcolonial critique and question Goya’s confidence in the the spirit of the Enlightenment. [i] The most significant difference between Goya’s image and Shonibare’s is that the latter has dressed his European male sitter in Dutch wax fabric or batik, which originated in the former Dutch colony, Indonesia, not in the West. Shonibare has made Dutch wax fabric one of the signature motifs in his oeuvre to demonstrate that fashion can be understood as a system of signs that have the capacity to communicate ideas and values, and these signs can be manipulated. His art targets companies such as Anthropologie and H&M (among other fashion companies), who refer to these fabrics and designs as tribal or African, thereby erasing the colonial history behind its production and distribution. Shonibare’s two prints attempt to combat this erasure by calling attention to the fabric’s layered history, which began in a time, ironically, when European intellectuals put a high value on human reason. This age of reason simultaneously included world conquest, the forced conversion of indigenous populations to forms of Christianity, the subjugation of millions in Africa, Asia, and the Americas, and the exploitation of labor to obtain raw materials for capitalist economies. These trenchant critiques directly correspond to Searle’s striking photographs Lament II and Lament III, taken from a 2011 performance called Shimmer along with Titus Kaphar’s haptic painting An Icon for Destiny from 2015. Searle’s photographs can be understood as mourning and resurrecting the memory of those who lost their lives under the brutal working conditions imposed by King Leopold II, leader of the Belgian Congo, attempting to inject their memory into the collective human consciousness, a symbolic act of historical revisionism. This commemorative action finds it counterpart on the opposite side of the room in Kaphar’s image of an anonymous female sitter covered in a thick impasto of tar and oil paint, a work dealing with concepts of labor, the plight of the African diaspora in the United States, forms of institutional racism present in the criminal justice system today, and questioning the canon of art history (which has been construed to elide and marginalize histories of those less powerful). While the first section of the exhibition contains a number of outstanding and poignant works that thoroughly introduce visitors to the overarching ideas of the show, there are a few formatting problems. For instance, there is not a wall text for the first object of the exhibition, Food Faerie. Further, the exhibition statement is placed to the left of the check-in counter in the second section. It would have been more appropriate for this text to appear either where one of Shonibare’s large prints is located or before the viewer even enters the first room of the exhibition. Despite this fact, the statement offers a satisfactory description of the exhibition and hints at some of the theoretical material that informs much of the work on display, particularly when the text discusses the work of Ebony G. Patterson, who has fifteen works in the show. 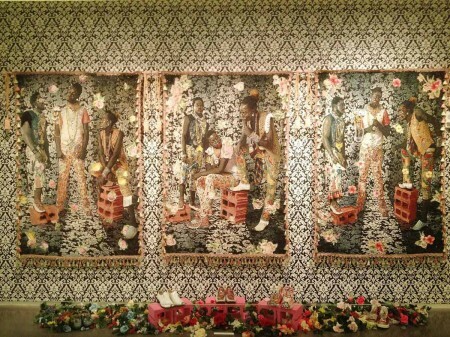 Ebony G. Patterson (Jamaican), Gully Godz in Conversations Revised I, II, and III, 2010. Wallpaper, fake flowers, bedazzled shoes, cinder blocks, and hand-embellished photo tapestries. 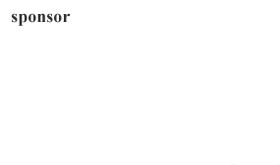 Stites maintains that “Patterson’s deconstruction of gender reveals the persistence of stereotyping…”[ii] This claim implicitly references the scholarship of Judith Butler and Jacques Derrida, both poststructuralist intellectuals. Butler has elaborated that gender is constructed through performance, which includes acts of speech (lexical signs) in addition to clothing and accessories (pictorial signs). [iii] Derrida has been one of the pioneering forces in a critical approach called Deconstruction, which seeks to break down or crack open the highly constructed norms, values, ideologies, and binaries perceived as inherent or natural in Western civilization. Deconstructionists are also interested in understanding how knowledge and meaning is produced. [iv] Patterson’s Gully Godz in Conversations Revised I, II, and III from 2010 (Figure 2), which awkwardly hangs behind the check-in counter for the hotel, grapples with several of these ontological notions. Gully Godz serves as the transitional object for visitors when they progress from the first section to the second, firmly bridging the previously raised ideas about how meaning is invested in clothing while highlighting new concepts about identity. Gully Godz is a set of three lavishly decorated jacquard photo tapestries that depict male Jamaican dance hall-goers arranged in various poses. The medium points to the traditional, Medieval art form of tapestry while simultaneously incorporating elements of camp aesthetics with hand-embellished jewels on the fabric. Patterson raises the idea of high brow and low brow art; fine art versus craft; and artistic labor versus manual labor (and how those distinctions themselves are constructed binaries). The works of Shonibare, Searle, and Kaphar all deal with labor in some form either through materials or subject matter, but Patterson complicates this guiding motif for the viewer. While labor, class, and memory form an important component of Gully Godz, the driving focus of the three photo tapestries deal with performance, identity, and stereotyping. Like her other mixed media works featured in the exhibition, such as Untitled (Blingas I) from the “Gangstas for Life” series (2008), Gully Godz explores the construction of masculine identity in dancehall culture. Young men in Jamaica–Patterson’s native home–appropriate feminine-coded adornment to create an identity that conforms to established standards within this community. Much of the work in Patterson’s recent series frames fashion as a semiotic system–that is, a sign system. Elements of fashion convey meaning, but only if those individuals receiving the signs are aware of the visual language system. The figures across the three tapestries don bedazzled platform shoes, pants with floral patterns, bracelets, necklaces, earrings, jeweled vests, and makeup. All of these accoutrements or sartorial signs signify certain ideas and values in the United States that correspond to the feminine. However, within the culture in which these accessories or signs operate, they correspond with the opposite. This demonstrates that signs are not naturally associated with any particular concept; rather, every sign communicates a concept that has been constructed by a culture and is imbued with metaphysical freight. As noted art historian and semiotician Keith Moxey has elucidated, semiotics “makes us aware that the cultural values with which we make sense of the world are a tissue of conventions that have been handed down from generation to generation by the members of the culture of which we are a part. It reminds us that there is nothing ‘natural’ about our values; they are social constructs that not only vary enormously in the course of time but differ radically from culture to culture.”[v] Patterns of viewing and behavior over generations reinforce the notion that signs correspond to one immutable idea. But Patterson proves this is not true; signs are indeed mutable and convey meaning based on the social and cultural milieu they function within. She adeptly cracks open constructed gender binaries in order to expose the invisible forces that structure human behavior, and further evinces that majority groups or those in power cast the “other” as different or unnatural in order to promote discrimination and stereotyping, thereby maintaining the status quo of power relations. 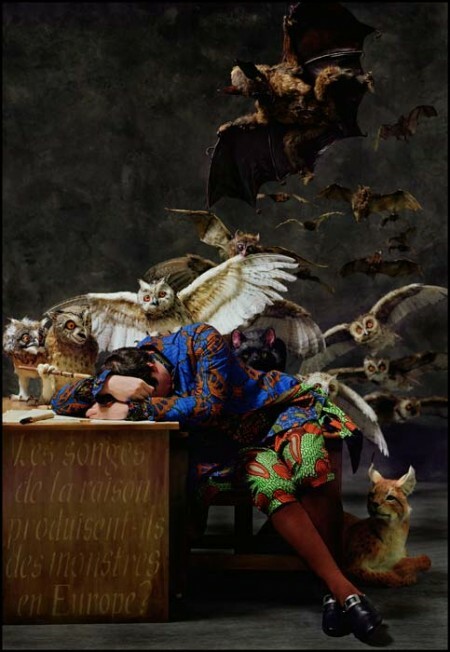 Yinka Shonibare, M.B.E. (British-Nigerian), Dorian Gray, 2001. Black and white resin prints, one digital Lambda print. This idea of normalcy or decorous, acceptable behavior as opposed to behavior deemed aberrant or indecorous also finds visual manifestation in Shonibare’s Dorian Gray from 2001 (Figure 3), housed in the small gallery adjacent to Gully Godz and other works by Patterson (who tends to dominate the second section of the exhibition). 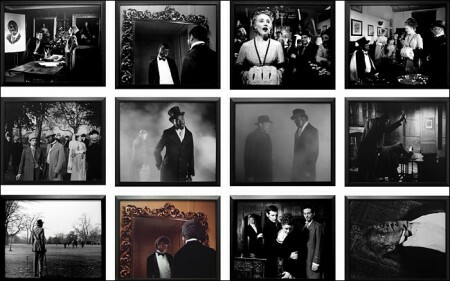 On the right wall of the side gallery, twelve photographs arranged in a grid re-stage pivotal scenes from the 1948 film Dorian Gray, with the artist playing the protagonist in each excerpted scene. In the film adaptation of Oscar Wilde’s novel The Picture of Dorian Gray (1890), the lead role was originally played by a white male. By inserting himself into this role Shonibare calls attention to how it would have been completely unacceptable for a man of color to portray the character Dorian Gray in 1940s America, exposing constructed codes of behavior based on skin color. Not only that, but the artist looks at codes related to sexual behavior by virtue of selecting a literary work by Oscar Wilde, who was an openly gay man during a time when such behavior was intolerable and punishable by law. In the novel, Dorian Gray pursues a duplicitous, hedonistic lifestyle, which shocked readers because this flew in the face of entrenched and proscribed late Victorian codes of decorum. Literature and art were meant to serve as exempla virtutis for citizens; universally accepted morals, values, and lessons were supposed to be passed down through these forms of culture. However, Wilde was one of the leading literary proponents of Aestheticism, a literary and artistic movement interested in divorcing art from serving a didactic role for public edification. Alternatively, aesthetes wanted to foster l’art pour l’art or art for art’s sake; art that encouraged one to contemplate and meditate upon notions of beauty and sensuality. This understanding of art was a Neo-Kantian conception of the aesthetic. Artists and writers involved in the Aesthetic Movement revived this understanding of beauty that originated during the Enlightenment. In his Critique of Aesthetic Judgement (1790), Immanuel Kant averred that true beauty is timeless and capable of eliciting strong human emotion regardless of the object’s location in time or space. [vi] In other words, Kant argued that some works of art possess a transcendental, indisputable beauty regardless of the viewer’s cultural heritage. This logic was indissolubly linked to a larger mental framework during the Enlightenment where individuals believed through scientific inquiry and rational thinking humans could uncover universal truths about the world. By consequence, a noblesse oblige attitude among European imperial powers developed, and they understood their global expeditions and actions abroad as justifiable. For Europeans, radically altering the way of life for indigenous populations to correspond with European institutions, values, and beliefs, was a benevolent act as it merely expedited the progression toward a common, attainable state of civilization. Shonibare’s photographic grid takes on this assumption of Western civilization, arguing that aesthetic value or beauty is not universal; appreciation for a work of art is dependent upon the overlapping of the values invested in the initial object and the values of the receptive culture. By selecting the story of Dorian Gray and placing himself within the re-staged photographs, Shonibare forces guests to see how codes of behavior and cultural values are fabricated according to groups who hold power in society. Dorian Gray also serves to remind viewers how those codes continue to be sustained today. Left: Installation view. Dinh Q. Lê (Vietnamese), Texture of Memory #9, 2000. Hand embroidery on cloth. Right: Installation view. Dinh Q. Lê (Vietnamese), Texture of Memory #15, 2000. Hand embroidery on cloth. The choice to hand embroider his work is significant. As with many of the other works in Dress Up, Speak Up significant meaning is invested in the physical materials used to construct the objects. Embroidery calls to mind the dichotomy between craft and fine art, manual labor and artistic labor that is also seen in Patterson’s tapestries. Lê straddles this divide and aligns himself with both traditions because on one hand the photographic models for this series featured members of the Cambodian intelligentsia who were murdered. Lê seems to align himself with these intellectuals who perished, and in this regard his work connects with Wang Qingsong’s Night Revels of Lao Li (2000), which explores the plight of intellectuals in Chinese history through regime changes. At the same time, Lê orients himself with the lower classes in Cambodia because manual labor was an integral part in building a sustainable economic foundation for the Marxist social engineering project undertaken by the Khmer Rouge. When spectators leave the main gallery on the second floor and enter the hallway that directs them to the rest of the show, a second exhibition statement awaits along with Frohawk Two Feathers’ I Haven’t Thought About My Own Reward. I Didn’t Really Come Here on My Own Accord. 1972 from 2012 and Fahamu Pecou’s Breathe from 2015. Together, these transitional objects carry on the themes of memory, commemoration, the semiotics of clothing, identity performance, colonialism, and labor. Despite this strong bridge, as the viewer progresses through the final rooms of the exhibition, the narrative structure begins to break down, leaving viewers to question the inclusion of some of the other works on display. Works by Daphne Arthur, Nathalia Edenmont, and Erwin Olaf seem to, at best, only tangentially relate to the exhibition’s narrative. Only the works of Lalla Essaydi, Anthony Goicolea, and Vivek Vilasini sustain the momentum and coherency of the show. Installation view of Dress Up, Speak Up. Lalla Essaydi (Moroccan), Converging Territories #14, 2004. Chromogenic print flush mounted on aluminum. In an adjacent side gallery off the hallway, Lalla Essaydi’s Converging Territories #14 from 2004 (Figure 5) presents three women in a domestic setting covered in white burqas inscribed with henna calligraphy. One woman, standing, stares directly at the viewer while the other two are seated with their backs turned, writing on a wall. Essaydi and her work fit nicely within the framework of Dress Up, Speak Up, but the placement of her chromogenic print in a small side gallery with furniture obstructing her work is puzzling. Perhaps it would have been more appropriate to place her work alongside one of Patterson’s in order to see how two women of different nationalities and cultural heritages handle the issue of proscribed codes of behavior. Not only does the placement of Essaydi’s print do a disservice to the artist, but the wall label fails to draw out some of the critical aspects of her work, especially information pertaining to this series. While the text calls attention to how the female figures are portrayed as serving a decorative function within the setting, it falls short of connecting this facet to Shonibare’s reference to Aestheticism in Dorian Gray. Aesthetic painters routinely allegorized women in their works, erasing their identity and placing them in domestic interiors as props or mere ornamentation that completed the design of the room. Additionally, the text does not mention the crucial fact that in Islamic tradition calligraphy is a masculine practice; understanding this fact enables the viewer to better appreciate how subversive her image actually is, and how Essaydi is calling attention to the demarcated spaces of masculine and feminine that still exist in the twenty-first century. Essaydi’s c-print is accompanied by two other prints by Anthony Goicolea: Sleeping from 2007 and The Tin Drum from 2006. Both of these works are photographic stills taken from the artist’s 2006 thirty-minute film The Septemberists (though viewers only become aware of this fact after leaving this gallery space). Through his film and by extension these stills, the artist asks viewers to consider how vestimentary systems force individuals to adhere to a proscribed mode of behavior or thinking. [viii] Further, because the setting for the film is an isolated and imagined landscape, Goicolea raises the notion of how values and hierarchies are shifting, as members in each community determine what is acceptable or desirable. In the adjacent room and hallway are two other c-prints that capture moments from his film: Dissection diptych and Triptych. Goicolea’s art explores how the signifying system of clothing, particularly uniforms, can be used to control human behavior and indoctrinate youth. In a setting that is reminiscent of summer camp or military barracks, Goicolea’s images of young men call to mind legends of Spartan male adolescent rites of passage and elements of the Hitler Jugend Bund der deutschen Arbeiterjugend (Hitler Youth League of German Worker Youth). While artists like Cave and Shonibare demonstrate how sartorial expression can be used as a form of dissent or call attention to cultural erasure, Goicolea’s work serves as a nice counterbalance because his prints conversely show how clothing is integral in controlling groups. Juxtaposing the prints of Goicolea with Cave’s Soundsuit or Shonibare’s sculptures would have provided a useful comparison; however, the work of the latter artists pack the first sections of the exhibition instead of being more evenly distributed. Vivek Vilasini (Indian), Last Supper–Gaza, 2008. KS inks on archival canvas. The final work in Dress Up, Speak Up is Vivek Vilasini’s 2008 Last Supper–Gaza (Figure 6). This striking palimpsest upends viewers’ expectations and explicitly references Leonardo da Vinci’s late fifteenth-century fresco The Last Supper in the convent of Santa Maria delle Grazie in Milan. However, like the previous works of Shonibare and Kaphar, Vilasini makes significant changes to the referent in order to compose a densely allusive, socially engaged photograph. Instead of Christ and his disciples seated at the table, Palestinian women in hijabs re-enact the moment in the Biblical story where Christ revealed that one among him would betray him. Vilasini’s models’ attempt to recreate the tensions in body language and intense gazes as da Vinci was able to in his masterwork. The banquet table is sparsely scattered with loaves of bread and pomegranates, a subtle reference to forced rationing in the Levant. Vilasini calls attention to the Israeli-Palestinian conflict and criticizes the actions of the Israeli government. By selecting one of the most important moments in the life of Christ–the instance where he sacrifices himself thereby forming a new covenant–as the subject for his photograph, Vilasini draws our attention to the specific teachings of Christ. Chief among those teachings are promoting peace and demonstrating compassion to individuals of all faiths. While elements in Last Supper–Gaza certainly correlate to some of the broader aspects of the exhibition (the function of dress in protest, cultural hybridity, etc.) it seems to be a work not fully up to the task of concluding the exhibition. There are a number of artists that come to mind–such as Patterson, Din Q. Lê, or Shonibare–who could have more forcefully and transparently manifested the critical concepts of the show to provide a stronger finish. Considering the opening salvo of visually arresting and intellectually stimulating works, the dénouement comes across as underwhelming and poorly conceived. Ultimately, Dress Up, Speak Up: Costume and Confrontation is an impressive and diverse array of socially engaged, multi-media artists who masterfully give visual manifestation to some of the most complex problems related to identity and cultural erasure that exist in our postmodern moment. Alice Gray Stites should be commended for boldly selecting works that challenge visitors to thoughtfully consider the postcolonial critiques offered up by the artists. However, curators are expected to do much more than select and arrange works for display. To my mind, there are two fundamental flaws with the exhibition: a lack of original scholarship and critical analysis for educational material and a number of formatting and design problems that not only prevent an intimate interaction with the objects on display, but create an environment that veers from the traditional museum atmosphere. Alarmingly, at no point in the educational material does the chief curator venture beyond vague language to describe how the arrangement of the works in Dress Up, Speak Up offers a new perspective on themes other art museums have already explored. 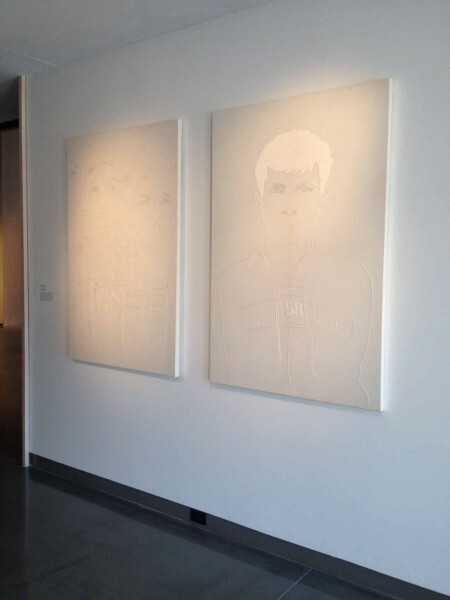 For instance, in 2010 the Akron Museum of Art organized Pattern ID, an exhibition that featured many of the same artists and dealt with comparable themes present in the 21c Museum Hotel show. The closest Stites comes in articulating a concise, explicit explanation of the central argument for the show is a terse remark in the exhibition brochure; she states that examining “who we are through who we were is the central confrontation animating the exhibition, from the shared public stage of history to the most intimate narratives on display.”[ix] Dress Up, Speak Up, in my estimation, needed a clearly defined, driving thesis, which would have improved the organization of the exhibition and allowed visitors to more clearly understand how this particular exhibition contributes to ongoing scholarship. Moreover, the language of the wall texts needed improvement because they repeatedly failed to help the average visitor fully appreciate the layers of meaning and multiple references found in the objects on display. By the midpoint of the exhibition (roughly when guests ascend the staircase connecting the first and second floors), viewers begin to notice a formulaic approach to how the wall labels are constructed. Nearly all contain quotations from the artists represented, and in several instances these are taken word-for-word from the artists’ websites. Further, much of the text for these labels is recycled and placed in the exhibition brochure or in one of the two exhibition statements. Using an artist’s own words to interpret a work is only one approach, and it is a bit strange to rely heavily upon this method when dealing with an exhibition of contemporary art because this approach is aligned with more traditional forms of art historical scholarship. As Marcel Duchamp observed: “All in all, the creative act is not performed by the artist alone; the spectator brings the work in contact with the external world by deciphering and interpreting its inner qualifications and thus adds his contribution to the creative act.”[x] While artists’ words can give a better sense about what they were trying to articulate, ultimately much of the meaning of postmodern art is dependent upon how individuals interrogate the objects. There are a multitude of methodological approaches to the study of art, and curators, I believe, ought to incorporate as many as reasonably possible when constructing texts for exhibitions. Unfortunately, the didactics throughout Dress Up, Speak Up are consistently unrefined and pleonastic; miss opportunities to encourage guests to forge connections between the physical materials of production and embedded meaning; neglect to mention comparable artists (such as Carrie Mae Weems, Kerry James Marshall, Willie Cole, and Kehinde Wiley) or show small photographs of comparative examples; fail to adequately guide guests through some of the more conceptually challenging aspects of the show; and fail to suggest multiple points of departure for interpretation. Collectively, the primary discursive spaces throughout the exhibition (the wall labels, exhibition statements, and exhibition brochure) display a lack of rigorous research on behalf of the curatorial team and fall short of sufficiently offering multiple avenues for interpretation. Aside from these concerns over text, research, and analysis, there are design features that make progression through the show more difficult than necessary, and create a viewing experience that is quite different from the traditional museum model. Due to the theoretical material that many of the artists in this exhibition draw upon, the conceptual framework for the show is rather unorthodox because it involves strands of critical theory. Stites seems to challenge the criticism some museum curators have previously lodged against theoretically-driven methods of organizing exhibitions, such as Gary Tinterow, Director of The Museum of Fine Arts, Houston, who opined in 1994 that “the perpetual skepticism and the self-regarding spiral proposed by current…theory is at essence almost completely incompatible with the study of historic objects, and that is why most curators find this mode of analysis effectively useless.”[xi] Perhaps the intellectual scaffolding for Dress Up, Speak Up is appropriate as the exhibition is entirely comprised of works produced in the twenty-first century and the nature of the venue is quite unusual. However, precisely because the works on display contain allusions to rather arcane theoretical material, the exhibition layout would have benefitted from a thematic organization that grouped artists and works together more strategically. I believe themed rooms would have given the exhibition more coherence, which would have been particularly useful for the second half of the show. What is more, aspects of the exhibition design clash with some of the most powerful critiques authored by this collection of artists. As guests view works in the lobby, small theatre, hallway, and side gallery in the first two sections, one inevitably overhears conversations about money, logistics, transactions, and in general members of the hotel staff catering to the material needs of hotel guests. These conversations create a jarring experience because as spectators consider how artists from around the world offer their eloquent assessments of the West’s history of colonialism, imperialism, and the exploitation of cheap labor to advance capitalist economies, they are reminded how pervasive materialism continues to be in Western civilization. This phenomenon is compounded by the decision to have popular, contemporary music play throughout the gallery spaces on the first and second floors. The consequences of this decision are such that one feels they have been placed in a retail environment looking at commodities for potential purchase, a situation the entrepreneurs of the hotel are perhaps not entirely uncomfortable with. 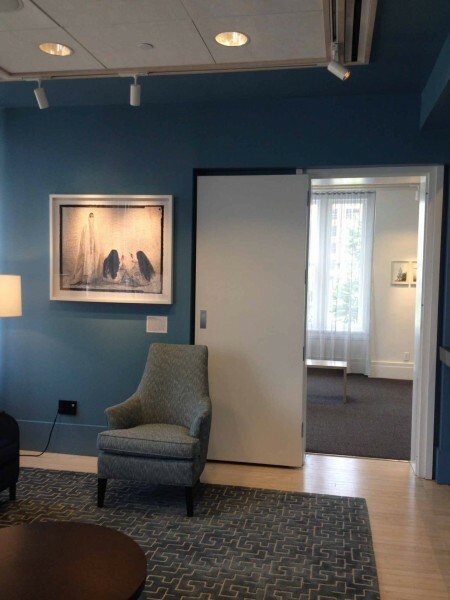 As I learned on the docent-led tour, staff members of the hotel put guests in contact with the galleries who represent the artists on display, if asked. Altogether, these conflicting design elements are troubling because a museum–a space for the muses–is an institution that ought to foster critical connections between the past and the present, a body that ought to guide viewers through human history via objects of creative expression. A museum is quite distinct from other venues for the exhibition of art (such as galleries) because it is concerned with public education, the representation of peoples of all cultures and times, and facilitating important conversations. A museum should not view visitors as potential buyers or collectors and connect them with gallerists. These exhibition flaws reveal some of the larger problems inherent in the idea of the 21c Museum Hotel enterprise, a hybrid institution attempting to exhibit contemporary art while simultaneously offering the amenities of a boutique hotel and upscale restaurant. The venture contributes to the ongoing problem of the commodification of culture–a product of neoliberal ideological thinking. A cursory glance at any newspaper article, magazine review, or press release published since the opening of the building reveals that contemporary art is discussed in the same breath as the dimensions for the suites, wi-fi specifics, espresso machines, and high-definition, flat screen televisions. Art should not be understood as a luxury or commodity. Art–as a form of culture–is indispensable; the offerings of a boutique hotel and restaurant, however, are dispensable. Yet, a critique of 21c Museum Hotel and its fraught institutional mission is outside the scope of this review. Despite the two major flaws that detract from the exhibition, Dress Up, Speak Up is undeniably a provocative assembly of works that are in conversation about some of the most salient issues pertaining to identity construction in the twenty-first century. While the execution of the exhibition falls short of the powerful potential that exists behind the concept, the show nonetheless presents an exceptional opportunity for local residents and visitors to bear witness to the impeccable craftsmanship of both rising and internationally-acclaimed artists. The show is open to the public twenty-four hours a day and free-of-charge through September 2016. Tours of the exhibition, along with the permanent, site-specific commissions, are led by Museum Manager Alex Brooks every Wednesday and Friday at 5:30pm at 21c Museum Hotel, 167 West Main Street, Lexington, Kentucky. –Tony Huffman is a M.A. Candidate and Barbato Fellow in the Case Western Reserve University and Cleveland Museum of Art Graduate Program in Art History in Cleveland, Ohio. His research interests include the early waves of the Modernist French avant-garde; critical theory; historiography; institutional critique; and the history of museums and collecting. [i] I am using the spelling “postcolonial” because as art historian Karen Overbey has shown the term “post-colonial” is problematic. The latter spelling is a descriptive term that implies a linear view of time with discrete, parallel segments in history (pre-colonial time, colonial time, and post-colonial time). This understanding of the term omits or erases the ways colonizer and colonized continue to affect each other after political independence. The former term is a critical term, one that takes into account the ways in which the identities of hybrid peoples are complex and their social conditions and subjectivities are permanently altered as a consequence upon first contact between local and imperial. [ii] Alice Gray Stites, First Exhibition Statement in Dress Up, Speak Up: Costume and Confrontation, 21c Museum Hotel, Lexington, Kentucky, 9 June 2016. [iii] See Judith Butler, Gender Trouble: Feminism and the Subversion of Identity (New York: Routledge, 1990). [iv] See Jacques Derrida, The Truth in Painting, translated by Geoff Bennington and Ian McLeod (Chicago: University of Chicago Press, 1987). [v] Keith Moxey, Chapter 3 “Authorship,” in The Practice of Theory: Poststructuralism, Cultural Politics, and Art History (Ithaca & London: Cornell University Press, 1994), 61. [vii] “Cambodia’s Brutal Khmer Rouge Regime,” BBC, 4 August 2014, http://www.bbc.com/news/world-asia-pacific-10684399. [viii] Here I am borrowing a term that Roland Barthes uses in The Fashion System, trans. Michael Ward and Richard Howard (New York: Hill & Wang, 1983). [ix] Alice Gray Stites, Dress Up, Speak Up: Costume and Confrontation (Louisville, KY: 21c Museum Hotel, 2016), unpaginated exhibition brochure. [x] Robert Lebel, Marcel Duchamp, with chapters by Marcel Duchamp, André Breton & H. P. Roche (New York: Paragraphic Books, 1959). [xi] Gary Tinterow, “The Blockbuster, Art History, and the Public: The Case of Origins of Impressionism,” in The Two Art Histories: The Museum and the University edited by Charles W. Haxthausen (Williamstown, MA: Sterling and Francine Clark Institute, 1994), 144.